This Acadian accordion was made in 1970 by Marc Savoy of Eunice, Louisiana, for Leonce L. Doucet, now deceased, of Port Allen, Louisiana. 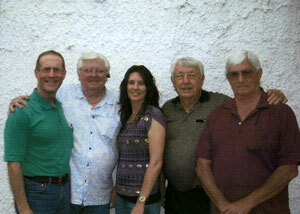 On September 12, 2009, members of the Doucet family donated the instrument to the Acadian Museum. 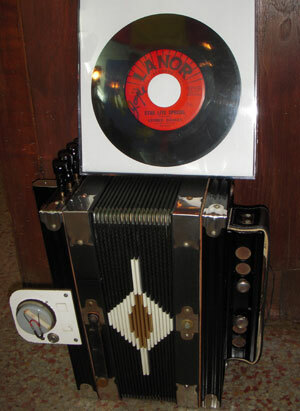 Also donated was this beautifully hand-crafted accordion case and the record "Star Lite Special"made by Doucet. 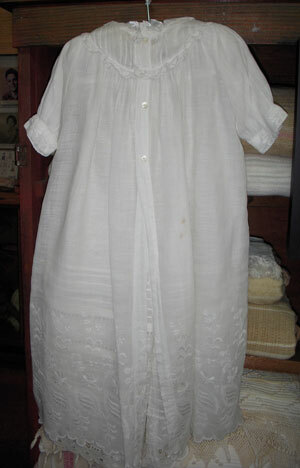 This christening gown was made from the wedding dress of Laura LeBleu, who was born September 18, 1887 and married to Bennett Opry. The wedding dress was passed down from LeBleu’s mother, Marie Emilie Jageunot, indicating that the cloth is approximately 125 years old. The gown was used to christen Floyd Joseph Doucet who was LeBleu’s oldest grandchild, as well as Doucet’s four brothers and one of Doucet’s grandchildren. The last person to be have been christened in it was Doucet’s oldest grandchild, Christine Doucet. Therefore, the heirloom gown was used by three generations of the family. Shown in the photograph are: (L to R): Warren A. Perrin, Chairman of the Acadian Museum, J. D. Doucet, Cherie Doucet, J. B. Doucet and Roy Doucet.